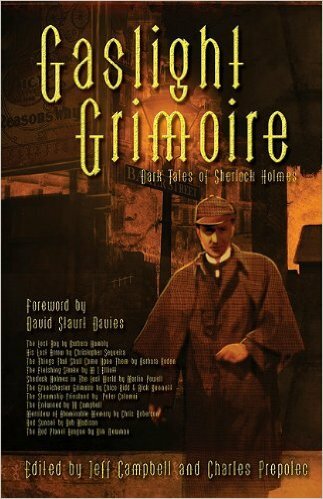 These three anthologies contain stories of Sherlock Holmes encountering the supernatural or other remarkable cases. 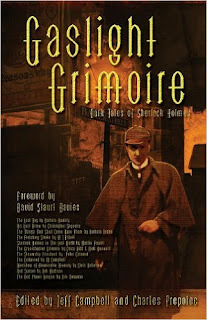 The first anthology, Gaslight Grimoire, included many crossovers, most of which Win included in the original volumes. The only one not included, which will be in the new volumes, is "Red Sunset" by Bob Madison. A private investigator asks an elderly, decrepit British consulting detective to assist him in a case involving a missing man, who upon being discovered by the American detective attacked him, forcing the detective to fire three bullets into him, which had no effect. The British sleuth deduces the younger detective works for either the Chandler or Continental agencies. The person responsible for the man’s strange condition is a Romanian Count, who mentions the Dutch doctor. The elderly British detective is Holmes. The Continental Detective Agency is from Dashiell Hammett’s Continental Op stories, and the American detective is the Op himself. The Romanian Count is Dracula, while his Dutch foe is Doctor Abraham Van Helsing. This story takes place during World War II, and the P.I. claims Holmes was smuggled out of London when the Blitz began, his continued existence being considered vital to British morale. This conflicts with the events of Anthony Boucher’s story "The Adventure of the Illustrious Impostor" and Manly Wade Wellman’s "But Our Hero Was Not Dead," both of which portray Holmes as still residing in London in 1941. References to Marshal Antonescu’s overthrow in Rumania would seem to place this story in 1944. However, Holmes says he is over a hundred-years-old. Since Holmes was born in 1854, he would be only 90 in 1944. 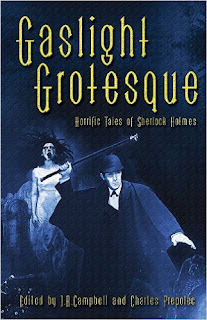 The feebleness and brittle bones displayed by Holmes in this story are inconsistent with references in several pastiches set in the CU to his discovery of a Royal Jelly elixir that arrests the aging process. Given all these factors, this story cannot take place in the CU. The second anthology is Gaslight Grotesque. In William Patrick Maynard's "The Tragic Case of the Child Prodigy," Holmes and Dr. Watson attempt to rescue young violin virtuoso Arthur Tremayne’s mother from the influence of occultist William Frawley. Back in Baker Street, Holmes tells Watson he will fetch Billy the page and see if young Mr. Pons is interested in learning the proper way to play the violin. Watson is married to Mary Morstan, which places this story before the Great Hiatus. August Derleth’s sleuth Solar Pons studied the art of detection under Holmes, who must have taught the ten-year-old Pons how to play the violin as well. In Neil Jackson's "Celeste," Holmes and Watson investigate the salvaged ship Mary Celeste alongside Dr. Joseph Jephson, whose father Habakuk was one of those who disappeared from the ship in 1872. Jephson says a diary allegedly written by his father is a hoax. The diary is a reference to Arthur Conan Doyle’s story "J. Habakuk Jephson’s Statement." Both Doyle’s and Jackson’s stories offer different solutions to the mystery of the historical Mary Celeste than Philip José Farmer’s The Other Log of Phileas Fogg, and therefore neither can take place in the CU. Doyle’s story also takes many liberties with the known true facts of the case. In Stephen Volk's "Hounded," Dr. Watson attends a séance where the Hound of the Baskervilles is conjured up. The late Sherlock Holmes forced Watson to write a mostly fabricated account of their encounter with Hound, including the false claim the beast was not in fact supernatural in origin. The spiritualist’s house contains a painting of a unicorn by Harvey Deacon and books by, among others, occultist Paul Le Duc; both individuals are from Arthur Conan Doyle’s short story "Playing with Fire." Professor George Challenger is mentioned as a believer in spiritualism. A reference to Rudolph Valentino places this story sometime between the 1914 events of "His Last Bow" (1914 also being the year Valentino began acting) and the star’s death in 1926. This story must be an AU. 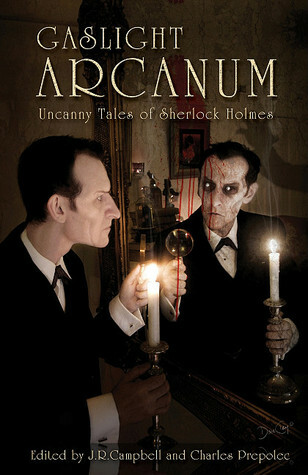 The third anthology is Gaslight Arcanum. I covered Kim Newman's "The Adventure of the Six Maledictions" in a previous post. The other crossover stories are all AUs. In "The Comfort of the Seine" by the aforementioned Stephen Volk, Holmes recounts his time in Paris, where he learned the art of detection from the supposedly deceased Edgar Allan Poe, then living under the name Dupin. Among the cases they investigated were the affair of the so-called "phantom" of the Paris Opera and the case of the horla and its tragically afflicted seer. These are references to Gaston Leroux’s The Phantom of the Opera and Guy de Maupassant’s "The Horla." Dupin is portrayed as a completely fictional character created by Poe. In Lawrence Connolly's "The Executioner," Frankenstein’s Monster revives Sherlock Holmes and Professor Moriarty after their fatal battle at Reichenbach Falls. In Kevin Cockle's "Sherlock Holmes and the Great Game," Holmes, discussing his fictionalized exploits with Watson, refers to "Challenger’s nonsense." This story portrays Holmes as having been granted insights by a mystic Zulu dagger given to Watson in Afghanistan rather than being a natural deductive genius. I'm reading Lady Slings the Booze by Spider Robinson. Win included it in Crossovers with Crocodile Dundee and Jeeves reference. This contains some minor spoilers below. It wouldn't ruin the book, but there is a revelation near the end that if not a major plot point is certainly surprising. I did notice a passage in which the main character Joe Quigley is asked if he's some kind of consulting detective like Sherlock Holmes. The character asking the question is the still alive Nikola Tesla. The dialogue is like they are referencing a real person not a fictional character. It's possible that Tesla met Sherlock Holmes or at least knew about him. There are a few other references to Holmes but they are slop references. Cool. Tesla's CU counterpart appears to have led a very busy life. Besides the Callahan's connection, he created Atomic Robo, he's one of the main characters of The Five Fists of Science, and he met Tarzan, Doctor Omega, and Secret Agent X. He probably has other appearances in the CU I'm forgetting. I knew of Atomic Robo and Five Fists. I vaguely remember Tarzan. I was kind of hoping that you (or someone else) knew of a story where he met Holmes. Tesla was as close to a Victorian/Pulp mad scientist as there ever was in the real world so it's only natural he would have several adventures in the CU. I forgot to mention this in my first post, but in the last story mentioned in the book, Watson got a Zulu dagger in Afghanistan? Zulus don't live in Afghanistan. Did he get it from another soldier? You are correct. The dagger was given to Watson by Murray, Watson's orderly, who was mentioned in "A Study in Scarlet," who said he brought it from Africa. Could be, since they apparently treat the Mythos as real, but I haven't it read it yet. I haven't read it yet, either, but it looks interesting.